The April update of Community Analyst is here! 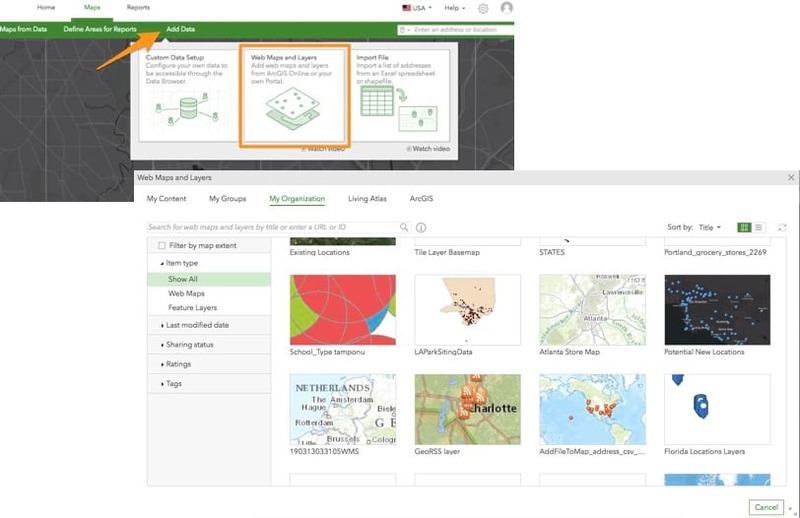 This update brings several enhancements including the new options for using point layers in Suitability Analysis, more streamlined experience with ArcGIS Online for finding and adding ArcGIS content, and improvements for the Build Infographics and New Comparison Reports workflows. Create and organize custom comparison reports more easily. Use a good performing location as a benchmark to evaluate other locations against it. Create multi-variable charts and more informative visualizations in just a few clicks. Learn more. 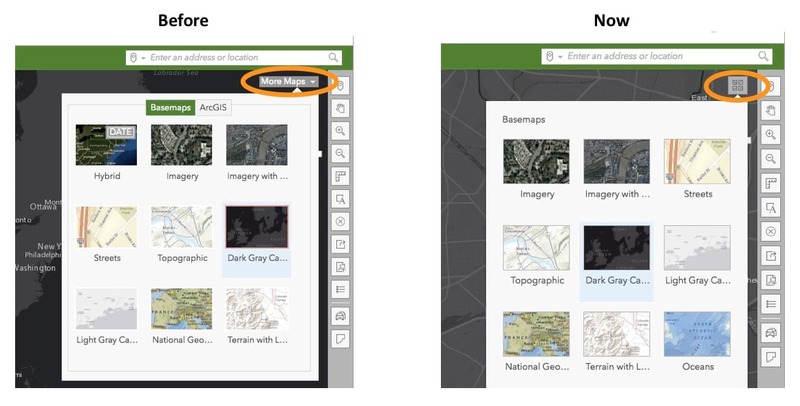 Easily find and add content from ArcGIS Online including the maps and layers you own, from groups, organization, and Living Atlas, as well as publicly available. 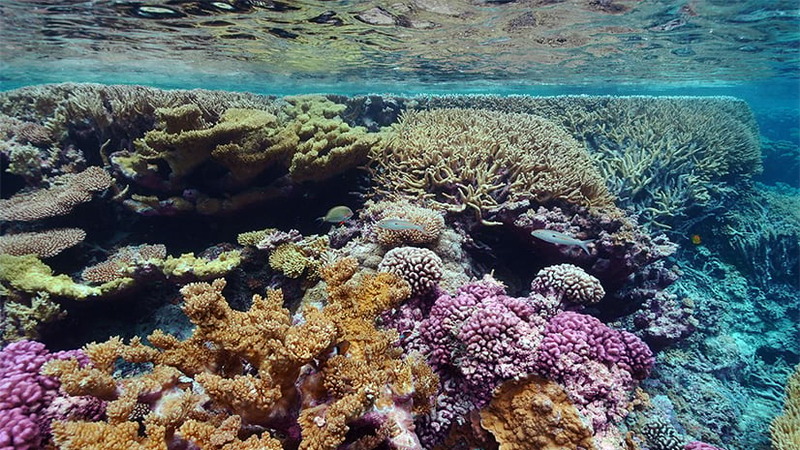 Use various filtering, sorting, and search options and get a content browsing experience consistent with what it is in ArcGIS Online. Learn more. You will also notice that the More Maps button will be replaced by a Basemaps icon to provide an easier way for changing basemaps. The experience of adding data from ArcGIS Online will continue to be available from the Add Data menu along with other options for bringing data in Community Analyst. Use distance to nearest competitor and attributes from the competition layer e.g. sales, number of employees, size of business when factoring-in competitive locations. Optimize suitability analysis with improved competitive landscape input around your sites. Calculate derived variables from your own data variables which are brought in using the Custom Data Setup workflow. For example, let’s say you have crime data from the city (e.g. crime assault, crime burglary etc.) added in Community Analyst as custom data. 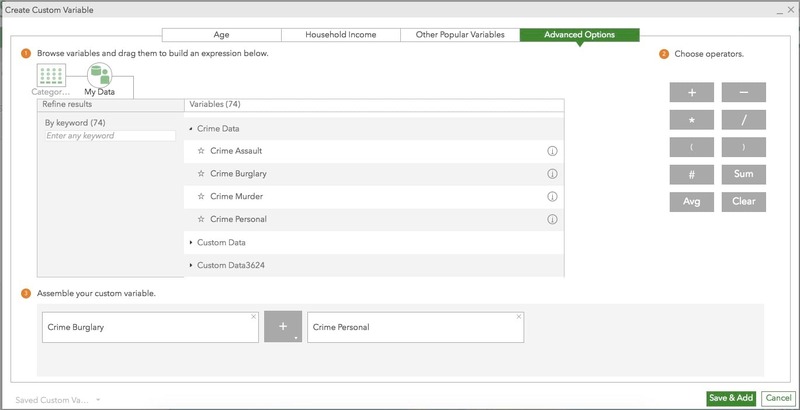 You can create a custom variable by adding various crime variables to determine the total crime. Create custom age pyramids. 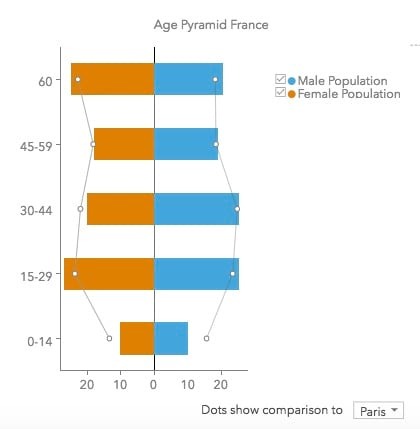 For example, use the Population by Age distribution variables for France and create an age pyramid to understand male and female population distribution by age in one view. 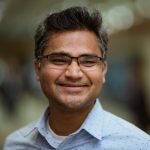 Create charts using negative values. For example, easily visualize demand and supply using positive and negative values respectively for them. Use text attributes from your own data in reports and infographics. For example, include the text-based parcel land use information in custom reports and infographics and put it together with numerical data (e.g. demographics) aggregated for your sites. Michael-Bauer Research data update to 2017 vintage for Western European countries including Belgium, Denmark, France, Germany, Netherlands, Spain, UK, and more and to 2016 vintage for Oceania, Carribean, North Africa, and Sub-Sahara African countries. Germany—The Advanced dataset from Nexiga was updated to include four additional data variables: Total Births, Total Deceased, Total Male Population, and Total Female Population. Japan—The Advanced dataset from Esri Japan was updated to include 2015 Census and Income and 2016 Spending and Savings data and more. Learn more on the Esri Demographics page. Login and start using the latest Community Analyst today.